One more New Year’s Eve. One more with no babysitter. One more where it’s just J and me. I thought I was getting a jump on NYE by making our dinner reservations back in November. I was all excited and really looking forward to dinner at The Gatsby. Turns out, The Entertainment District had their own plans for the big night. A few weeks ago, I started seeing ads for a big part in the E.D. that included a buffet for something at The Gatsby. I figured I better find out if my reservations were still good…even though they took it and confirmed it. Turns out, they never should have taken the reservation….but the guy who e-mailed me was nice enough to try and sell me $99 tickets to the big festivities. So, with The Gatsby out, we were on to Plan B. Our next thought was to try Casa Bolero. The switch to a tapas bar looked interesting. J called earlier in the week to get reservations….and found out they were closed on New Year’s Eve. At this point, neither of us really had any ideas…until J brought up Rustica. J went to Rustica a couple of months ago with some friends, but I had yet to try the place. The downside to Rustica is they don’t take reservations….well, that was probably an upside since we were planning this only a few days from New Year’s Eve. The plan was to get there right at 5:00 when they opened. We were a few minutes late getting to The Mall at about quarter after. I dropped J off in front of the building then went to find a parking spot. She waited for me to get back and we walked in to the tiny space together. Just a few feet inside the door is the hostess station. We walked up to the hostess who looked at us and didn’t say anything. J said, “Hi.” She said, “Hi.” Then the staring match continued. She didn’t ask how many or anything…just continued to look at us. J finally said there were two of us if they had a table. The hostess said she did and asked if we had called ahead. We said no then she grabbed a couple menus and took us to a four top adjacent to the open kitchen. 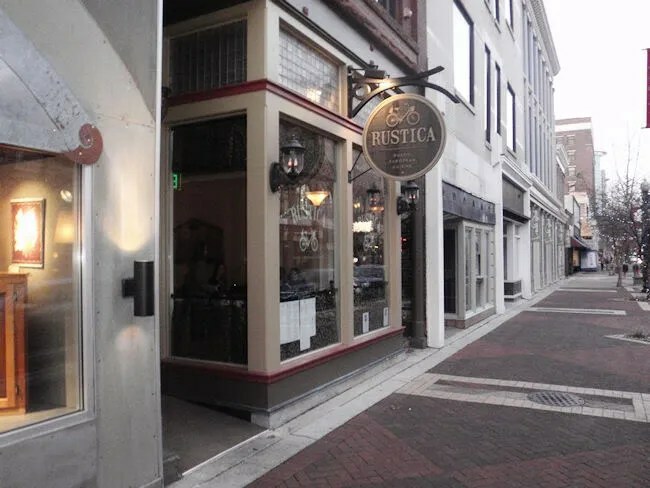 Rustica is a very intimate space with tables crammed in. Most of the tables are two tops since this really is a fine dining experience, but there were a handful of four tops mixed in to the space. By the time we got there at 5:20 or so, only a few tables remained. In the far back of the restaurant, there’s a bar that I could just barely see from where I was sitting. Neither of us got up to go check it out, but in case you would have to wait, that bar is the only place to really wait inside. Our waiter came over to tell us about the specials and get drink orders. As much as J wanted wine, she decided not to draw attention to herself and got an Iced Tea. I grabbed the beer list and found a small Michigan beer section that had Arcadia’s Hop Mouth Double IPA. The waiter came back with the drinks, a basket of bread, and asked if we had any questions about the specials or the menu. We decided to start with the Artisan Cheese Plate. 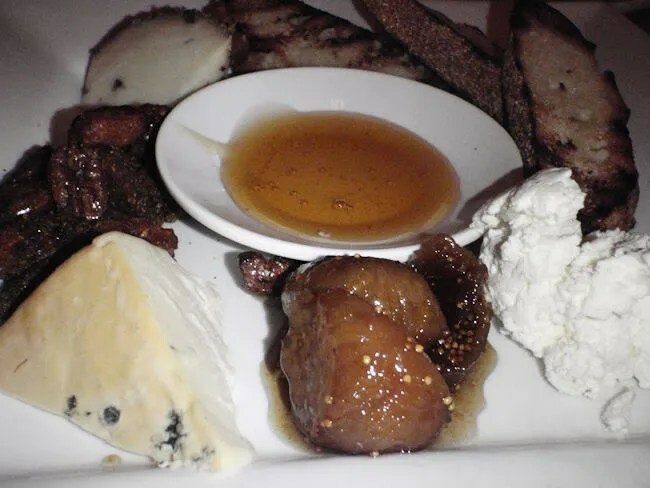 The cheeses on the plate were a peppered white cheddar, a bleu cheese, and a goat cheese. The plate also comes with three pieces of grilled bread, a house jam, local honey, and spiced nuts. We shared the cheddar then J stuck to the goat cheese and I got the bleu cheese. We both lovers of all things cheese and this was a delicious way to start the dinner. We probably could have used one more piece of bread, but we made it work. The crunchy bread was so delicious with the soft cheeses. J used the honey as a topping on her goat cheese and she really seemed to enjoy the nuts. I was happy just to stick to the cheese and I was just a tad disappointed when it was gone. I was very tempted to order the Grilled Hangar Steak, but I went some place I don’t usually go when we go out. I ordered the Grilled Pork Chop instead. 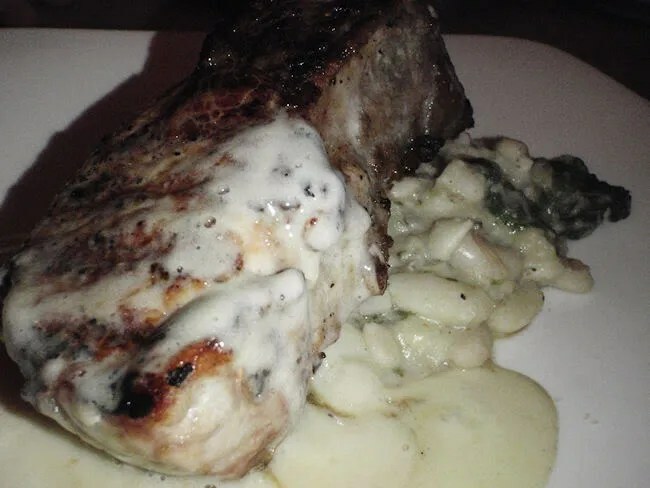 This very large piece of smoked pork hock came with a white bean ragout, mustard greens, and house mustard. I went straight for the large piece of meat. The pork was very tender and very juicy. There was still a hint of pink in the middle, but the outside had a nice flame kissed crust. The house mustard was more of a thin sauce than what you would normally think of as a mustard, but it had a great tangy taste to it. THe white bean ragout and the mustard greens were mixed together and acted as a bed for the pork. I wasn’t a huge fan, but I don’t really like beans either. J took a bite and said it tasted like a white bean soup. J’s entree was the Hand-Made Parmesan Potato Gnocchi. 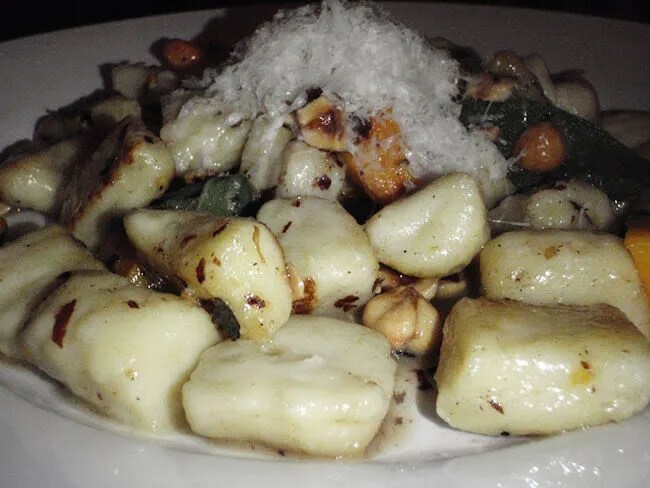 Mixed in with the gnocchi was butternut squash, hazelnut, sage, and brown butter. She said it tasted like fluffy noodles and enjoyed it so much she wanted to save half of it to bring home. Last time she ate at Rustica, they only had gnocchi with an andouille sausage which she wasn’t a huge fan of. This dish was much more to her liking. The thing that really surprised me about Rustica was portion size. I actually expected to hit up a drive thru on the way home like I typically do after fine dining outings, but we were both pretty stuffed when the waiter came back with a dessert menu. The trio of gelato was tempting, but we decided to forgo dessert and just get our check. The bill was just a bit over $55. Again, kind of surprising as I expected to spend more. I felt like we got a really great meal for that price and have no complaints. Service was great on a very busy night as our waiter was always around when we needed him and the kitchen seemed to be cranking out plates. 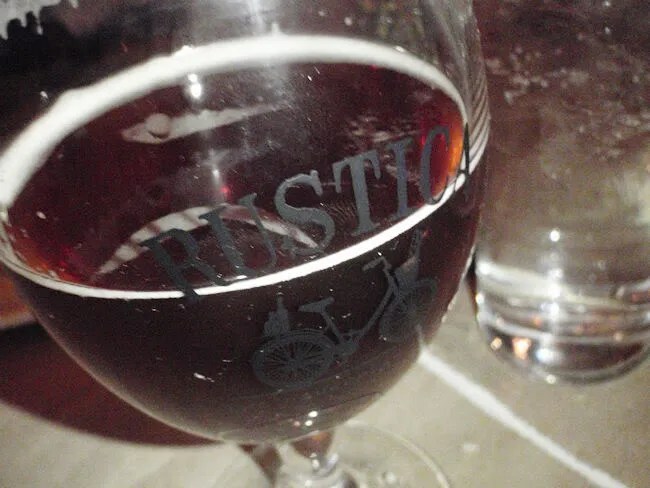 I’ve been wanting to get in to Rustica since it opened a few years ago, but I hate waiting for a table. Our strategy tonight to get in close to opening worked out really well for us and I’m kind of glad our original dinner plans fell through. 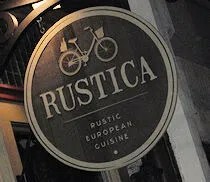 Rustica came through for us tonight making our last New Year’s Eve as just the two of us a special one.